Practise, practise, practise! Our lessons are important, but they exist mostly just to guide you. Practising is how we make playing a part of our life, and is how we build our own personal journey with playing music. For adults and older kids, practise at least 1/2 an hour every day. Young kids, at least 15 mins a day. If you can build your practise sessions up to an hour or two you'll be fast tracking it! If you can't play every day, practise as often as you can manage, minimum 3 times a week. Consistency is the key. Listen to a lot of music that inspires you. And go out and hear live music as often as you can! Look after your body. When practising, keep the awareness in your body and be aware of any arising tensions. If tension shows up, put on your detective hat and try to work out why it's there and let me know about it! We can troubleshoot any tensions from playing together in our lessons. When playing, above all focus on your sound and resonance, and the sensations of it. Take your time. With all of it. Don't rush. With difficult things, be systematic. Keep a lesson journal and or log book. 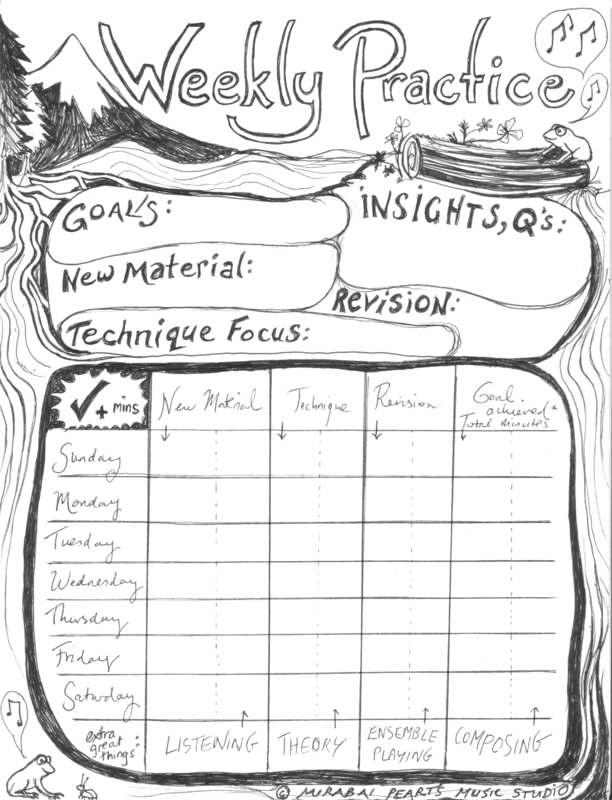 There are many practise log templates available on line. I scratched one up you're welcome to use here. ﻿Keep your materials organised, i.e loose pages in a folder. When you're ready, create as many opportunities to play music with others and for others as possible. It's so rewarding! sharing our music is one of the sweetest fruits of our practise. Think of yourself as a musician! Nurture your musical ideas, whether they're about how you like a certain tune to sound, or if you're coming up with your own musical ideas (record them, write them down! ), you'll be allowing yourself to grow as your very own kind of musician.